It’s been a weekend of tidying and sorting. 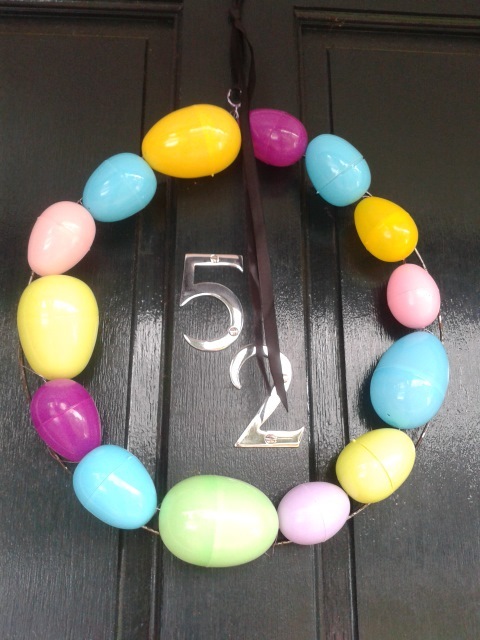 I’ve cleared out the workshop and we’ve started decorating the house for Easter. I made this door wreath with my little one last year. 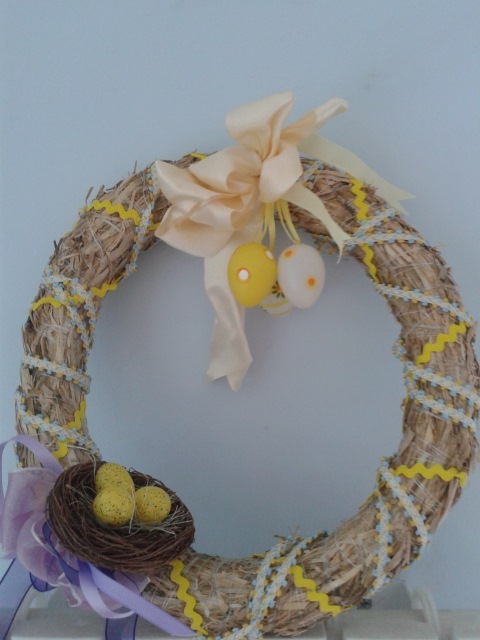 We undressed a straw-based Christmas door wreath and wound it with ric-rac braid and ribbon, added a nest of eggs at the base and put a lovely ribbon and hanging eggs at the top. Since remodelling our kitchen several years ago there’s a great space between the pendant lights above the island unit and the kitchen table to decorate with the changing sessions. I’ve strung baker’s twine between the two lights and use that to hang decorative items from. 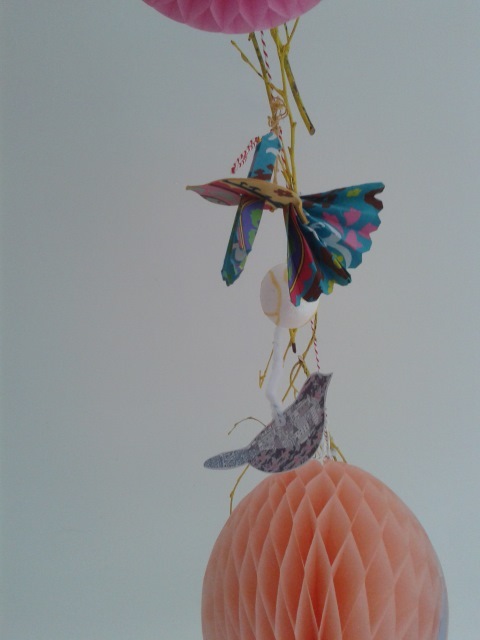 This year I’ve attached lengths of silver birch (spayed yellow) and an assortment of birds, eggs and 3-D paper eggs. 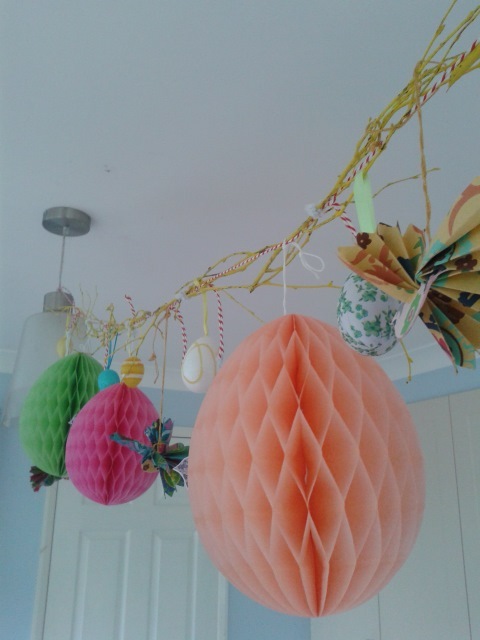 The paper eggs were a gift from my sister – I think they came from Sainsbury’s. Some of the birds were cut out from a magazine I picked up at White Stuff. Working above your head can be a bit awkward. I find that using pipe cleaners, which can be twisted one-handed works really well. As with my Christmas baubles, I like to display my ever growing collection of eggs in a glass bowl. Next to it I’ve got a lovely white rabbit. He came from a charity shop several years ago. I’ve tied a green gingham bow around his neck, so that he looks extra festive. Check out Mr Rabbit’s appearance is my blog last year. I forgot to photograph my tree. I used a willow structure as my base (which was originally made at a contemporary flowers class that I taught earlier in the year). The willow has started to sprout, so there’s some new spring growth amongst the knarled and twisting branches. It’s now festooned with eggs, which much like our Christmas tree, get re-arranged every time someone who-thinks-they-have-superior taste walks past. I have a brand new wreath for the front door, which was made with the help of my sister. We used plastic eggs – the kind that split in half for filling with chocolate eggs for an Easter Egg Hunt. If you look carefully they have little holes at the end, making it easy to thread onto wire. While all my sister’s eggs had holes at both ends, mine didn’t. This was easily remedied by heating up a floristry wire in flame of the gas hob in the kitchen and then piercing it through the egg casing. Very satisfying work, but do take care if you give it a try. The wire I threaded my eggs onto wasn’t very substantial, so once strung together I bound the necklace of eggs onto a more rigid circular form. 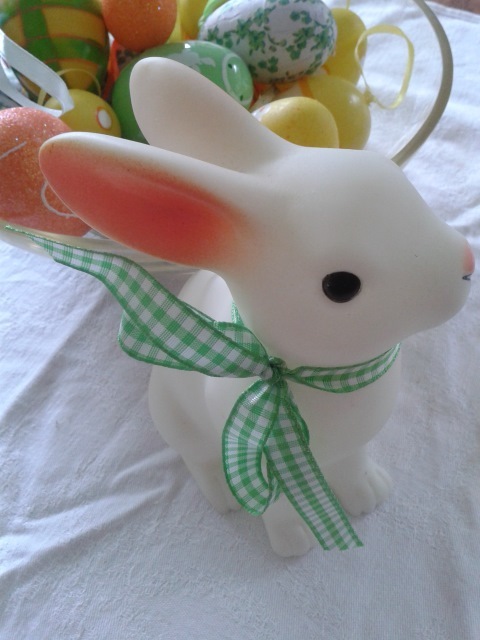 I’d love to hear how you decorate for Easter – do drop me a line in the comments box below.